The Leith opens into a welcoming hall, which leads to the large lounge and in turn to the wonderful kitchen and dining area with patio doors opening out onto the rear garden. There is a convenient downstairs WC and a large integral garage. 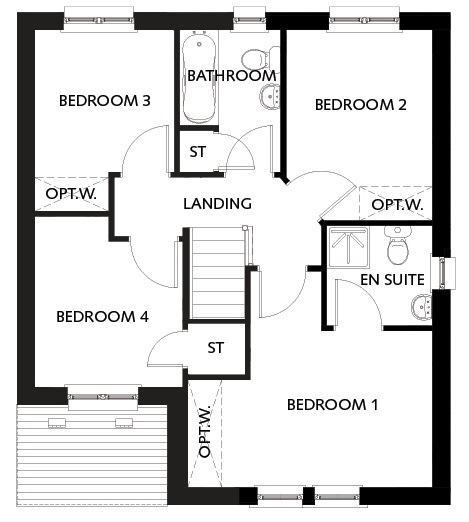 On the first floor you'll find 4 bedrooms, the master with en suite facilities and also the family bathroom. This home has been designed to suit growing families and those in need of additional space. 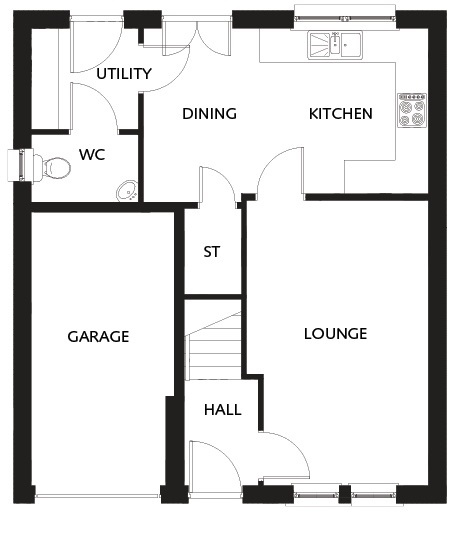 Floorplans may vary from plot to plot so please check with your sales adviser for exact details. Disclaimer: There are variations of each house type. Please ask a sales advisor for more information on the type of Leith used at this development. Thornhill Wynd is collection of two bedroom apartments and two, three, four and five bedroom homes in Falkirk, Stirling. 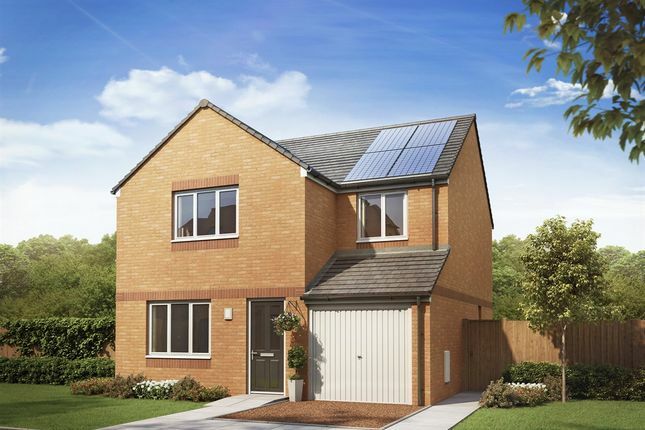 With so much choice on offer these stylish homes are perfect for first time buyers through to growing families. Positioned within the heart of Falkirk just a short walk from the town centre means you can take advantage of all the amenities of this vibrant town. It's one of the largest urban areas in Scotland and so benefits from extensive shopping and leisure facilities, including a multi-screen cinema, swimming pools, golf courses and a number of bars and restaurants. Central Retail Park Falkirk is a mile away from Thornhill Wynd. There's a large choice of high street stores, restaurants, coffee shops and a cinema. Within Falkirk town centre there are a range of high street and independent shops and places to eat. Howgate Shopping Centre is also a popular, offering a wide selection of shops and eateries. Falkirk is also the home to the Kelpies, a very well-known visitor attraction. Constructed in 2013 these 30-metre high horses are a sight to be seen, not only for their feat of engineering but also for the beautiful surrounding Scottish countryside. For the golfers amongst you, the Falkirk Golf Club is also within walking distance. Other key local activities include the Polmont Farm Dry Ski Centre and the Helix Ecopark, which is 350 hectares of land between Falkirk and Grangemouth for cyclists, walkers and runners. Falkirk is also home to what could be Scotland's first structural icon of the twenty-first century, the fascinating Falkirk Wheel. 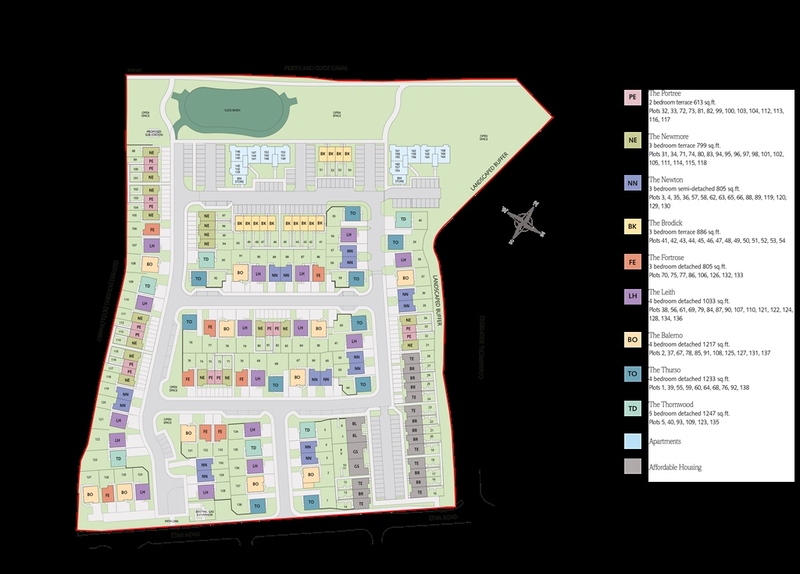 There's a choice of schools close to the Thornhill Wynd development including Carousel Childcare, Victoria Primary School and St Andrews Primary School. Graeme High School is a short drive away. With so many local amenities and attractions, Thornhill Wynd has something for everyone and is a fantastic place to call home. Arrange an appointment to find out more information this much-anticipated development. Central Retail Park Falkirk is a mile away from Thornhill Wynd. There's a large choice of high street stores, restaurants, coffee shops and a cinema. Within Falkirk town centre there are a range of high street and independent shops and places to eat. Howgate Centre is also a popular place to shop. Linlithgow Palace is close to Thornhill Wynd and is a fantasic day out for all the family. Thornhill Wynd enjoys a great central location with excellent transport links via rail and road. Falkirk High and Camelon train stations are conveniently close to the development and offer easy routes to Glasgow and Edinburgh. Road links include the M9, M876 and A80, the M9 heads north to Stirling and south to Falkirk and further afield to Edinburgh. Whether it's for business or leisure use, you're also within easy range of Edinburgh and Glasgow airports. Head west along M9 from Newbridge roundabout. Exit M9 at junction 5 (A904 Falkirk/Grangemouth). At the roundabout take the first exit to A9At Bog Road take second exit to stay on A9. Continue on A9. Take the first exit on to Etna Road. Property descriptions and related information displayed on this page, with the exclusion of Running Costs data, are marketing materials provided by Persimmon - Thornhill Wynd, and do not constitute property particulars. Please contact Persimmon - Thornhill Wynd for full details and further information. The Running Costs data displayed on this page are provided by SmartNewHomes to give an indication of potential running costs based on various data sources. SmartNewHomes does not warrant or accept any responsibility for the accuracy or completeness of the property descriptions, related information or Running Costs data provided here.